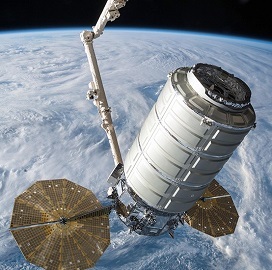 Northrop Grumman is scheduled to launch the Cygnus spacecraft on April 17 to bring supplies and scientific experiments to the International Space Station as part of its 11th and final cargo resupply mission under the Commercial Resupply Services-1 contract with NASA. The spacecraft will take off from the Mid-Atlantic Regional Spaceport at Wallops Flight Facility in Wallops Island, Va., aboard Northrop's Antares rocket, the agency said Wednesday. Cygnus is equipped with a new load system designed to allow personnel to include time-sensitive experiments into the spacecraft just 24 hours before the liftoff. Previous launches required all cargo to be loaded at least four days before the mission. The upcoming mission will deliver scientific investigations that include Advanced Colloids Experiment-Temperature-10, Space Environment Causes Acceleration of Vascular Aging: Roles of Hypogravity, Nutrition and Radiation and Bio-Analyzer. NASA expects a cargo launch under the CRS-2 contract to begin in the fall.